Periodic, ongoing website maintenance is critical to your website functioning properly and warding off attempted website hacks and attacks (which continue to increase). Just as important, as your business needs evolve, your website may need to evolve to support them. Regular attention from Evo can keep your website safe and help it remain an important piece of your communication and client service strategies. Evo automatically installs all WordPress core file updates and plugin updates for clients as they become available. This free service is critical to protect your site (and also to protect the server) from being hacked and used as a spam platform. If a server becomes identified as a source of spam, other servers may block emails sent from it, and Google may display a warning page on sites hosted on an offending server (which will display for 30 days without appeal, so there’s no quick fix). These ongoing updates meet the minimum maintenance requirement. They keep your site safe from the most common attacks, but they do nothing to keep your site relevant and capable of supporting your evolving business needs. Where Does Sustainability Come In? 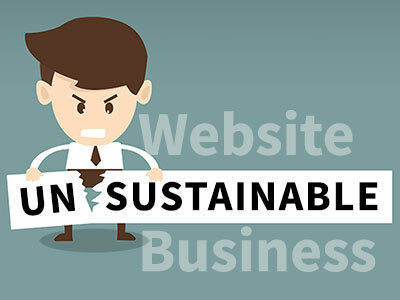 There are two areas of sustainability associated with website maintenance. The first is the continuing viability of your website as a business tool. It’s unlikely the site you had two years ago is still the site you still need today. Without ongoing content updates and additions, your site loses its ability to function as a marketing tool. Without functional upgrades, it loses its ability to support your evolving business needs. To remain viable, your website requires ongoing attention both from you and your developer. The second area of sustainability is Evo’s approach to assisting our clients with changes (both for content updates and tweaks or changes to “how things work”). For years we’ve made small changes and updates without billing for them. As requests for such changes have increased in volume, we cannot continue to offer minor updates for free. As a result, we’re offering two levels of monthly Website Maintenance Plans. For clients who choose not to subscribe to either plan, we’ll be charging our regular hourly rate ($85), in 15-minute increments, for content updates and other website changes. You can also find this information under our “Services” tab. *Hourly rate (currently $85/hr) applies beyond plan limits (billed in 15-minute increments). You might notice some services in the above chart that Evo hasn’t offered before (except by request). First, automatic site backups and site migration services can save you a lot of time and heartburn. Second, annual site review and recommendations (may involve a meeting or interview prior to recommendations) can help make sure your site supports your business needs. For people who are serious about making their website work for them, this review is essential. Third, site inspections on a weekly basis to find and fix any issues caused by automatic plugin and WordPress core updates can literally keep your site functioning properly. In the past, when we stumbled on something broken by an update, we just fixed it. Inevitably, however, that meant we had to look at all the sites we’d developed, and we’d lose most of a day (or more) fixing things that most of our clients didn’t realize were broken. We’ll continue to offer that level of service for maintenance plan subscribers, but no longer for non-subscribers (who can still contact us for issues, paying our hourly rate for fixes). Just like your car, your website often costs more to fix than it does to maintain properly. In addition, some glitches can actually cost you business, and you may be completely unaware of it until you’ve lost thousands of dollars. Our goal is to make sure your website is one of your best business tools. Our website maintenance plans can help make sure your website is just that, now and going forward.